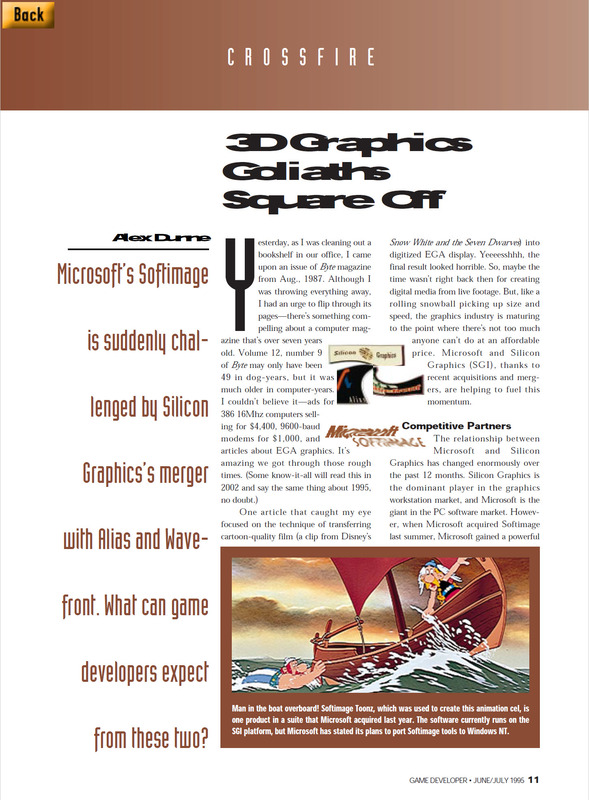 GAME DEVELOPER • JUNE/JULY 1995 Microsoft’s Softimage is suddenly challenged by Silicon Graphics’s merger with Alias and Wavefront. What can game developers expect from these two? One article that caught my eye focused on the technique of transferring cartoon-quality film (a clip from Disney’s Snow White and the Seven Dwarves) into digitized EGA display. Yeeeesshhh, the final result looked horrible. So, maybe the time wasn’t right back then for creating digital media from live footage. But, like a rolling snowball picking up size and speed, the graphics industry is maturing to the point where there’s not too much anyone can’t do at an affordable price. Microsoft and Silicon Graphics (SGI), thanks to recent acquisitions and mergers, are helping to fuel this momentum. workstation market, and Microsoft is the giant in the PC software market. However, when Microsoft acquired Softimage last summer, Microsoft gained a powerful suite of IRIX-based animation, editing, compositing, and cel animation tools. It instantly became a key partner of SGI. Eight months later—last February—SGI merged with Alias and Wavefront, two companies that compete against Softimage on the SGI platform. How have these developments changed the relationship between Silicon Graphics and Microsoft? More importantly, how does it affect their customers? I spoke with Andrew Wright, group product manager of advanced authoring tools for Microsoft/Softimage, and Dave Larson, director of marketing for Silicon Studios, a wholly owned subsidiary of Silicon Graphics, about the actions their companies have taken recently in the digital entertainment industry. The most recent event, Silicon Graphics’ merger with Alias and Wavefront, achieved two objectives for SGI, according to Larson. What was Wright’s reaction to the SGI merger? I sensed no edginess from either Wright or Larson about the relationship between Microsoft and SGI, and both played up the positive aspects of their new product lines. Wright stressed the fact that many of SGI’s partners, not just Microsoft, were now competitors, but that it wouldn’t make sense for SGI to consider them as such: “Yes, we are a competitor to [Silicon Graphics], but they’re also a competitor to a number of their other ISVs [independent software vendors]. Companies like Side Effects, Discreet Logic, Avid… One thing I can say absolutely outright is that if SGI loses their third-party applications as a result of this merger, they’re dead in the water. I think they’ve almost got to overcompensate to make sure that their third party ISVs are treated fairly,” Wright commented. 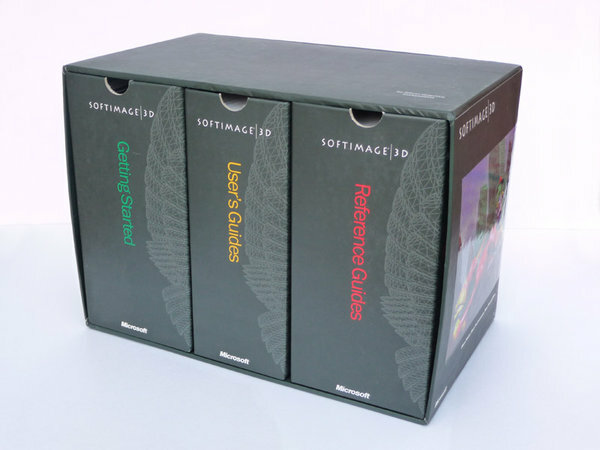 Softimage off the SGI Platform? 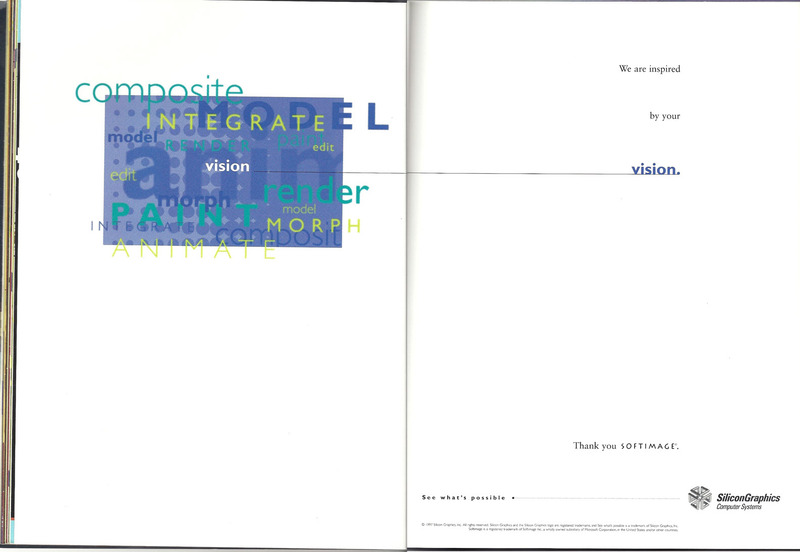 Upon acquiring Softimage last year, Microsoft stated its intention to port the Softimage tools over to Windows NT. I asked Wright whether Microsoft had plans to pull Softimage products off the SGI platform at a later date and focus exclusively on its own operating system implementation. Microsoft looks at its partner/competitor relationship with SGI in the same light as its association with Apple. 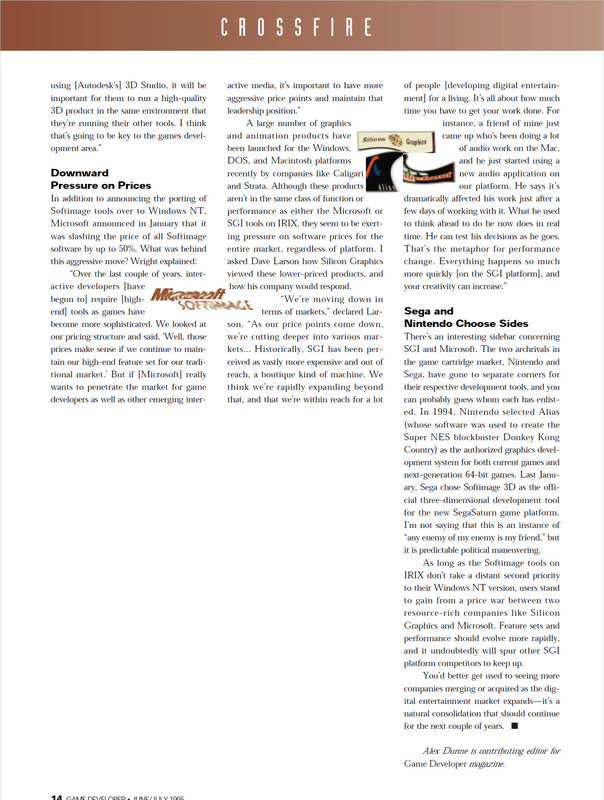 Wright sees Silicon Graphics remaining the superior platform for highend digital video and three-dimensional animation over Windows NT, just as the Macintosh held its position as the superior platform for graphic design when Windows 3.0 was introduced. 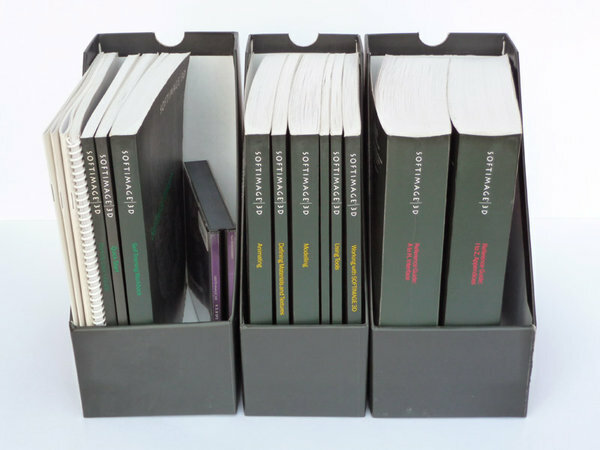 “Macintosh had a very strong position in graphic design. Windows came in and everybody thought that it was going to completely take over the market. As a result, companies like Aldus and Adobe developed their applications first on Windows and second on Macintosh. But they realized over time that the Mac wasn’t going to go away… We think a similar thing is going to happen in the SGI world,” Wright said. 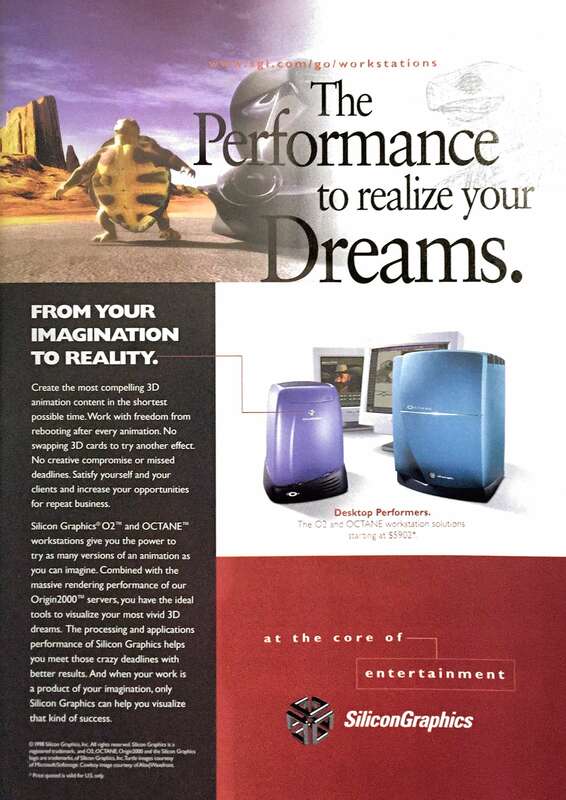 Upon acquiring Softimage, Microsoft announced that it would port the company’s toolset to Windows NT. 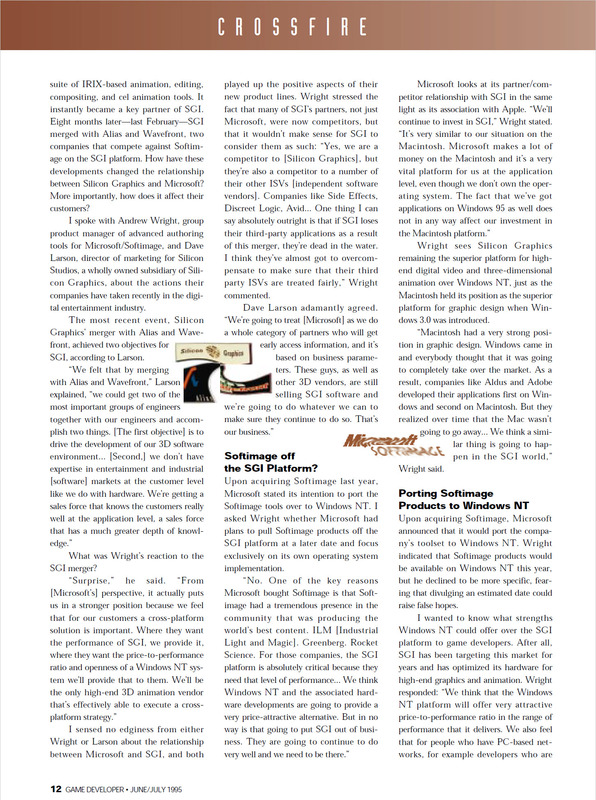 Wright indicated that Softimage products would be available on Windows NT this year, but he declined to be more specific, fearing that divulging an estimated date could raise false hopes. A large number of graphics and animation products have been launched for the Windows, DOS, and Macintosh platforms recently by companies like Caligari and Strata. Although these products aren’t in the same class of function or performance as either the Microsoft or SGI tools on IRIX, they seem to be exerting pressure on software prices for the entire market, regardless of platform. I asked Dave Larson how Silicon Graphics viewed these lower-priced products, and how his company would respond. There’s an interesting sidebar concerning SGI and Microsoft. The two archrivals in the game cartridge market, Nintendo and Sega, have gone to separate corners for their respective development tools, and you can probably guess whom each has enlisted. In 1994, Nintendo selected Alias (whose software was used to create the Super NES blockbuster Donkey Kong Country) as the authorized graphics development system for both current games and next-generation 64-bit games. 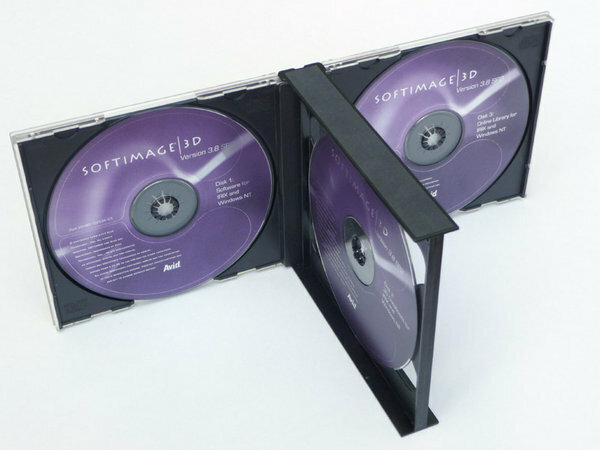 Last January, Sega chose Softimage 3D as the official three-dimensional development tool for the new SegaSaturn game platform. I’m not saying that this is an instance of “any enemy of my enemy is my friend,” but it is predictable political maneuvering. As long as the Softimage tools on IRIX don’t take a distant second priority to their Windows NT version, users stand to gain from a price war between two resource-rich companies like Silicon Graphics and Microsoft. Feature sets and performance should evolve more rapidly, and it undoubtedly will spur other SGI platform competitors to keep up. You’d better get used to seeing more companies merging or acquired as the digital entertainment market expands—it’s a natural consolidation that should continue for the next couple of years.